(1) Potential buyers: These people want to investigate every bike out there before they plunk down the major cash that they earned in a corporate sweat shop. (2) The needy: These people already bought a bike and just want confirmation that the bike they already own is as good as they think it is. After all, they invested $9000 in the decision-making process. (3) The disgruntled: These people like to read bad things about the bikes they would never buy. These readers neither own nor plan to buy that brand; they just want to be looky-loos at an accident site. It is possible that the last bike they bought was an IT175. There are six machines in contention for the 2015 MXA 450 shootout: the Honda CRF450, Kawasaki KX450F, KTM 450SXF, Yamaha YZ450F, Husqvarna FC450 and Suzuki RM-Z450. You may think that one of these six bikes is going to win and the other five will lose; however, the MXA wrecking crew doesn’t look at it that way. While we may anoint one bike as the best of the year, the five bikes that don’t win have their own allurements — good traits, advantages and benefits that could outweigh the MXA wrecking crew’s fairly straightforward approach to racing performance. Make no mistake about it; we aren’t looking at these six bikes for their play riding, enduro, offroad or professional practice riding prowess. To us, these are purebred race bikes, and that’s how we tested and rated them. Our information is just a suggestion. Potential buyers should look at all of the factors before throwing their plastic money on the counter. There are a lot of qualities that could make the worst bike in our comparison the best bike for you. Read ’em and weep. Why did it finish sixth? 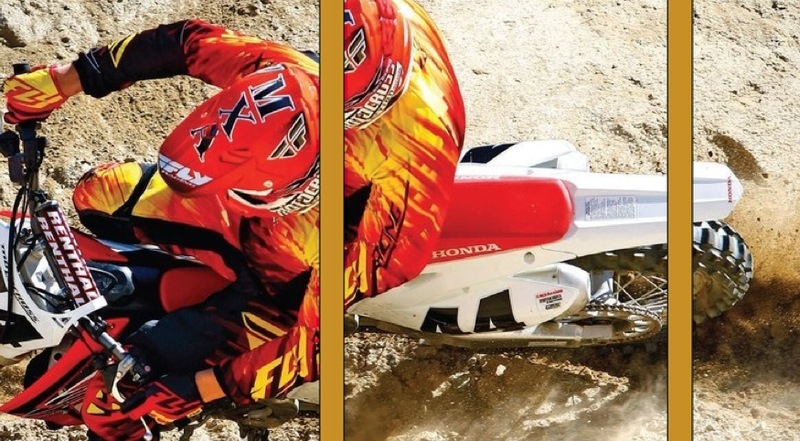 Honda rode to the highest highs possible with the brilliant 2008 Honda CRF450. Then, they threw it all away in 2009 when Honda’s engineers wanted to write their names in the annals of motorcycle design with a new engine, new frame, new geometry, new suspension and new approach. They did make a mark—on the “fail list.” The 2009-through-2012 CRF450s were creative and atrocious at the same time. Starting in 2013, Honda started backpedaling, trying to get back to where it was in 2008. Honda isn’t there yet, but it is on its way. The 2015 Honda CRF450’s best attribute is its light weight. Not only is it light, but it feels light on the track. It feels more like a CRF250 than a CRF450—and in large measure that is because it makes the least horsepower of any bike in this shootout (and less peak power than the two 350cc bikes that we didn’t include). Why is it so slow? Are Honda’s engineers incapable of making competitive power? Is the Unicam design off the mark? No, no and no. It is slow for bureaucratic reasons. Say what? Honda has a corporate belief that modern motocross bikes are too powerful and that the consumer — you — would be much better off with an easier-to-ride, less powerful and more manageable power output. So, they built an engine that produces 2-1/2 horsepower less than the class leader at 8000 rpm, 7-1/2 horsepower less at 10,000 rpm and 10 horsepower less at 11,000 rpm. Why should it lose? It’s slow, has a weak clutch, flames out and is twitchy at high-speed. What skill level is the CRF450 best suited for? Novice. Why did it finish fifth? To the MXA wrecking crew, the Suzuki RM-Z450 has always felt like an unfinished project. Test riders love the incredibly accurate cornering, but hate the high-speed stability issues. They love the broad and luscious midrange powerband, but can’t use it because of the pitiful stock brakes. For 2015, Suzuki gave it the old college try with all-new SFF TAC air forks, reconfigured radiator hoses, frame changes and a bundle of electronic gizmos. They should have left the electronics on the shelf and fixed the clutch and brakes. The common misconception is that the Suzuki RM-Z450 is the best-handling bike on the track. That’s not true. It is the best-cornering bike, not the best handling. When it isn’t turning left or right, it is nothing to write home about. But, when it comes to making sharp cuts, it has no equal. And, its ability to dive inside is highlighted by its very interesting powerband. It is a no-frills engine that has just the right amount of power for every situation. There are faster engines on the showroom floors, but they don’t offer the flexibility of the low-to-mid Suzuki powerplant. Good thrust without much fanfare. Why should it lose? Weak brakes, weak clutch, questionable stability and antiquated design. 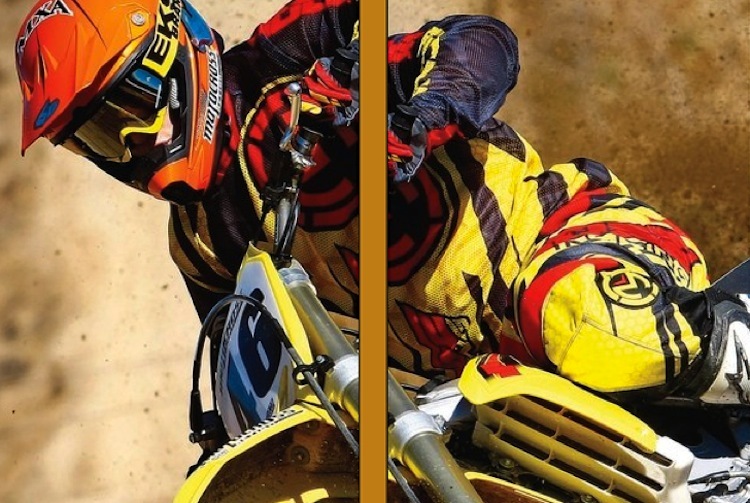 What skill level is the RM-Z450 best suited for? This bike works best in the hands of Pro riders or anyone who rides on tight, jumpy tracks. The last word? The 2015 Suzuki RM-Z450 relied on glitzy electronic add-ons and air forks to pull it up in the rankings. Sadly, the parts of the RM-Z450 that aren’t glitzy—the brakes, clutch and reliability—are where Suzuki should have focused its efforts. Fourth place. That can’t be true. Oh, how the mighty have fallen. Why did it finish fourth? It pains us to no end to rate the 2015 Kawasaki KX450F in fourth place. This bike is the favorite race bike of several MXA test riders. It won the MXA 450 shootout in 2009, 2012, 2013 and 2014. And, it isn’t any worse than it was when it won last year. So, why did it fall from first to fourth? The real answer is that the KX450F won all four of its 450 shootouts for one reason and one reason alone — power. The KX450F has always had a fabulous engine. It is strong off the bottom without being jerky. It is usable in the middle with a potent, broad and steady pull. And, that powerband advantage was able to obscure how mediocre the rest of the KX450F was. Now, for 2015, although it still has a very sweet powerband, it is no longer the power leader. In fact, the Kawasaki has fallen to fourth in horsepower — aided no doubt by the fact that Kawasaki mellowed the power for 2015. Without its massive power advantage, the Kawasaki KX450F had to be judged more critically on the rest of its package — and the rest of the package came up short. The handling is old-school. The gearbox won’t shift under a load. The clutch is frail. The weight, girth and mass need to come down. The TAC Air forks are complicated. The gearbox has gaps. Why should it lose? Apart from its good engine, this bike feels old-fashioned. 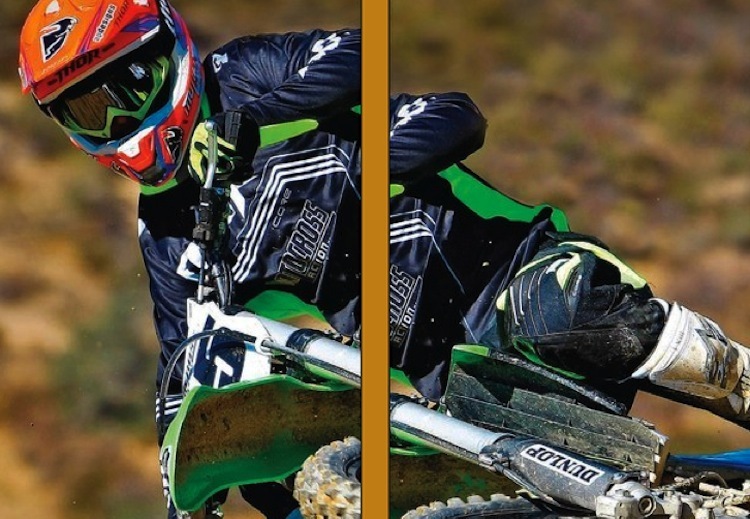 What skill level is the KX450F best suited for? Thanks to its mellower powerband, this bike will work in any class from Novice to Pro. The last word? We look forward to a new chassis in 2016. Why did it finish third? In all honesty, the 2015 Yamaha YZ450F should have won this shootout. It had the two most important things on every racer’s wish list: power and suspension. Not only does it make the most power on the dyno by a large margin, but that power is blatantly evident from the saddle. It’s not just fast — it is the fastest. Adding to its allure is undeniably the best suspension of 2015. Forget the new generation of air forks; Yamaha’s old-school SSS suspension blows them away. No contest. So, here is a bike that is faster and better suspended than anything on the track, yet it is locked in third place. Why? Because everything else about the YZ450F is an acquired taste. The airbox is ungainly, awkward and loud. The trick Dzus fasteners on the airbox fly off and often rip your pants in the process. The overall feel of the bike is that it is tall, bulky, wide and heavy. In fact, it isn’t any taller, bulkier, wider or heavier than its competition — but it feels like it is. The brakes are inadequate for a bike this powerful. The handling is still disconcerting at the entrance to turns. The rubber grommets fall out of the radiator scoops and gas-cap cover. Why should it lose? Its charms (power and suspension) are ruined by its overall oddness. The last word? Proof positive that the fastest bike doesn’t always win. Why did it finish second? The obvious truth is that once the 2015 KTM 450SXF was selected as the winner, the Husqvarna FC450 was destined to ride its coattails to the second spot in the MXA 450 shootout. It couldn’t be any other way. No one could rank the Husky and the KTM very far apart. Why? Because the Husqvarna is a KTM clone. It shares 95 percent of its parts with the 450SXF. Now, you might wonder why, if the KTM 450SXF and the Husky FC450 are clones, the KTM and Husky aren’t co-winners of this shootout. The answer lies in the 5 percent that the Husky doesn’t share with the KTM. The Husky lost the top spot because its engineers got creative with the subframe. Instead of using KTM’s aluminum subframe, Husky built a unique polyamide plastic subframe. And while most MXA test riders like the resilient feel of the plastic subframe over jumps and in the corners, they don’t like what the subframe did to the airbox. The thicker plastic structure and restrictive airbox cover muted the FC450 powerband, especially on throttle response. Thus, the KTM engine was livelier and more responsive than the identical engine in the Husqvarna. It wasn’t a deal-breaker, though, because there were test riders who liked the metered delivery of the Husky better than that of the KTM. Why should it lose? The 4CS forks aren’t up to snuff, the airbox is restrictive, the seat cove ris like an ice rink and its heavier than the KTM. What skill level is the FC450 best suited for? With its easier-to-ride low-to-mid transition and more resilient frame, the 2015 Husqvarna is a very good 450cc machine for Novices and Vets. The last word? There can’t be two Picassos, but there can be a Rembrandt and a Monet. Why did it win? 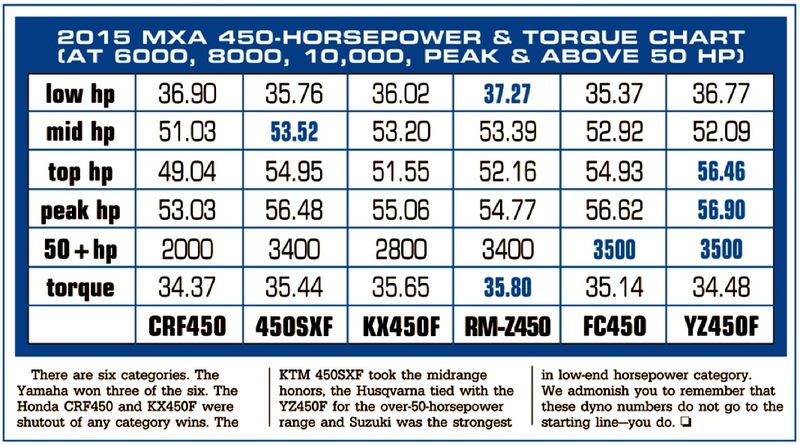 If you think about it rationally, the features that highlight the 2015 KTM 450SXF probably won’t make it to the Japanese brands for four or five years. It is that far ahead of its competition. The KTM 450SXF is the best-spec’ed bike on the planet. Need proof? It has the broadest power. It makes the second-most horsepower. The chain guide and buffer pad are indestructible. It has the best brakes. It comes with a hydraulic clutch—a Belleville clutch at that. The hubs are machined from billet. It is the easiest-starting bike because it has an electric starter. It delivers the best all-around handling in the class. The fuel lines not only have easy-to-use quick-release fittings, but they have inline, replaceable fuel filters. Changing the air filter requires no tools. KTM specs high-tech SKF fork seals. The graphics are in-mold so they don’t wear out. It offers the best shifting in the class—even under a load. You can adjust the compression and rebound on the forks by hand—even with gloves on. What skill level is the 450SXF best suited for? Because the power delivery is so broad, it has the ability to start out very manageable and gain thrust as the rpm increase. This makes it a good bike for a wide variety of racers, but because of its electric starter and bulletproof design, the 2015 KTM 450SXF is the best Vet Expert bike made. The last word? Perhaps it is because KTM specializes in building dirt bikes while the “Big Four” specialize in side-by-sides, but KTM is on the fast track to the top. The Austrian manufacturer doesn’t confine itself to the four-year production cycle — and that shows in virtually every part on the 2015 KTM 450SXF. As for your part of the equation, all you need to do is send out the forks for a re-valve. Motorcycle shootouts are funny things. They bring out attributes — both good and bad — that you would never discover by riding any individual bike by itself. They also tell us something about motocross racers’ tastes and the manufacturers’ willingness to address their customers’ wants and needs. Here are eight undeniable facts about shootouts. 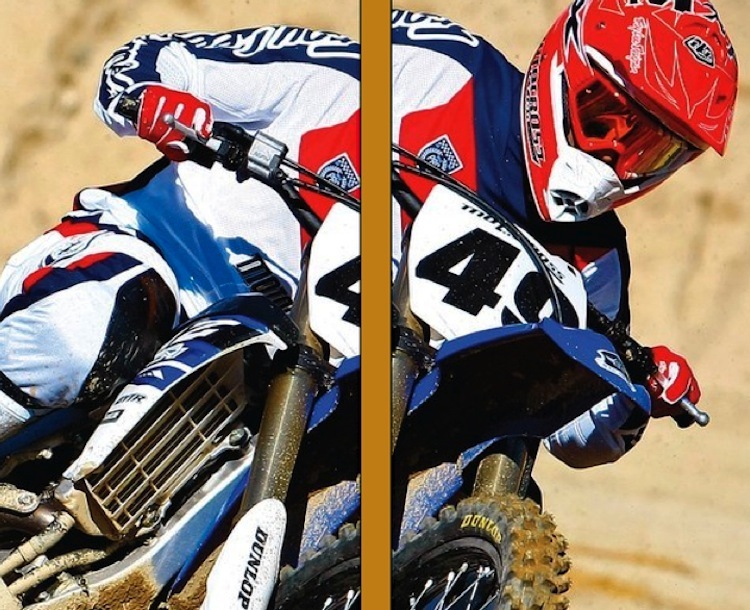 Neither the fastest bike nor the slowest bike won MXA’s 2015 450 shootout. Why not? 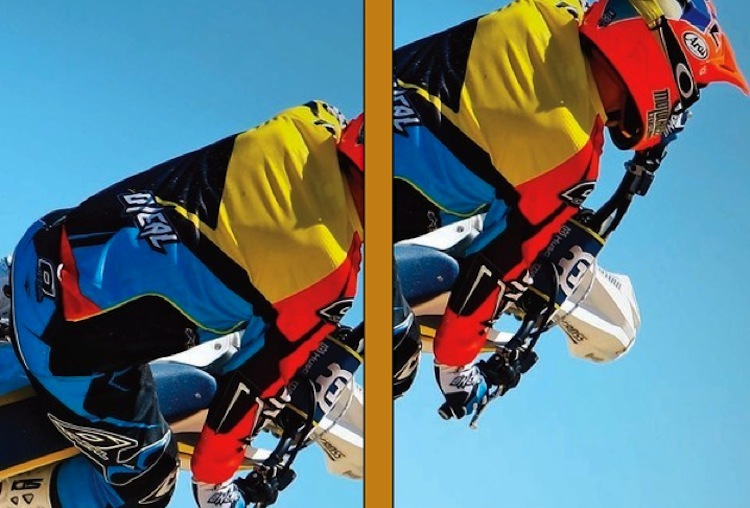 Motocross is more about power quality than power quantity. It’s not how much you make; it’s how you make it. However, if you don’t make enough power, it doesn’t matter how you make it. The two best-turning bikes in this shootout (the RM-Z450 and CRF450) are one-trick ponies. They turn very well, but they shake at speed, twitch in the rough and generally require nerves of steel and a St. Christopher medal on big, fast tracks. Overall handling prowess does not come with the best-cornering pedigree. Let’s not get too misty about air forks. They aren’t spec’ed on 2015 bikes because they are the best forks available. They are OEM equipment because they are cheaper and lighter than coil-spring forks. Air forks improve the manufacturers’ bottom line and weight specifications. The best forks made in 2015 are Yamaha’s old-school (heck, just plain old) Kayaba SSS coil-spring forks.If you need to revlave your forks—set aside another $250 for a simple revlave or mega bucks for exotica. It’s no secret that many manufacturers select their clutch-spring rates based on how easy they can make the clutch pull feel on the showroom floor; a buyer is more likely to be impressed by a light clutch pull. The downside is that the Kawasaki, Suzuki, Honda and, to a lesser extent, Yamaha clutches aren’t up to the task at hand for heavy clutch users. A new clutch costs $90, so enjoy that showroom moment as much as possible, because you’ll be back with your credit card next month. A complete clutch fix, like a Hinson clutch, cost closer to $1000. 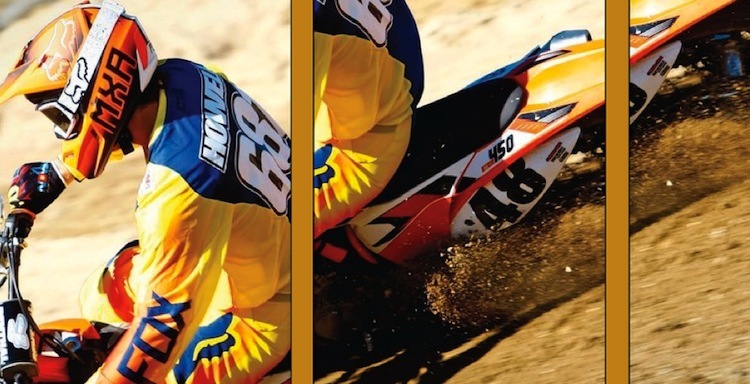 The KTM and Husqvarna have no such problems, thanks to their hydraulic Belleville clutch design. Test riders don’t like bikes that “mystery shift,” won’t shift under power or miss shifts. We believe that most people who plunk down close to 10 grand don’t like those things, either. The Suzuki, Kawasaki and Yamaha suffer from one or more of these flaws. Honda doesn’t have shifting issues because its low-rpm powerband doesn’t create much gear lash. That leaves Husqvarna and KTM as the most accurate-shifting bikes on the track.